From New York Times and USA TODAY bestselling author Cassandra Clare comes an exciting new short story collection that follows Jem Carstairs as he travels through the many Shadow Markets around the world. 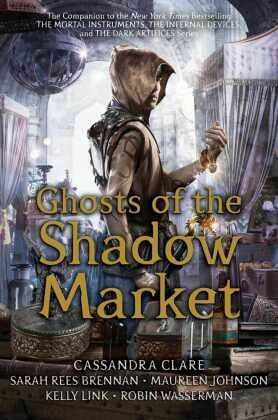 Ghosts of the Shadow Market is a Shadowhunters novel. The Shadow Market is a meeting point for faeries, werewolves, warlocks, and vampires. There, the Downworlders buy and sell magical objects, make dark bargains, and whisper secrets they do not want the Nephilim to know. Through two centuries, however, there has been a frequent visitor to the Shadow Market from the City of Bones, the very heart of the Shadowhunters' world. As a Silent Brother, Brother Zachariah is a sworn keeper of the laws and lore of the Nephilim. But once he was a Shadowhunter called Jem Carstairs, and his love, then and always, is the warlock Tessa Gray. And Jem is searching through the Shadow Markets, in many different cities over long years, for a relic from his past. Follow Jem and see, against the backdrop of the Shadow Market's dark dealings and festival, Anna Lightwood's doomed romance, Matthew Fairchild's great sin, and Tessa Gray as she is plunged into a world war. Valentine Morgenstern buys a soul at the Market and a young Jace Wayland's soul finds safe harbor. In the Market is hidden a lost heir and a beloved ghost, and no one can save you once you have traded away your heart. Not even Brother Zachariah. Sarah Rees Brennan is the New York Times bestselling author of the critically acclaimed Unspoken and The Demon's Lexicon trilogy. Her most recent book, In Other Lands, was a Hugo Award finalist. Visit her at SarahReesBrennan.com.